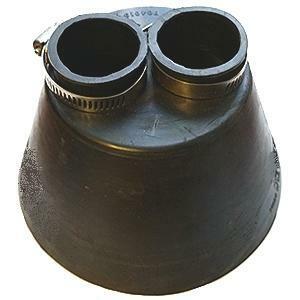 PRODUCT: ASI # 704019, A/C Conduit 2-Pipe Flashing / Rain / Storm Collar, 2-Pipe, Heavy-Duty 0.24 inch thick Black EPDM. Fits Two 3/4 Inch Conduit Pipes (1.23 actual hole ID). 5 inch wide base x 3.3 high. Includes 2 Stainless Steel Pipe Clamps. Price/Each. 5 inches diameter at the base x 3.3 inches high. 2 stainless steel band clamps. Slip pipes through flashing collar (not retrofit type).